Survey and positioning services provider iSURVEY said it has completed a 30-day geophysical seabed survey for offshore pipelay and subsea construction company Allseas. 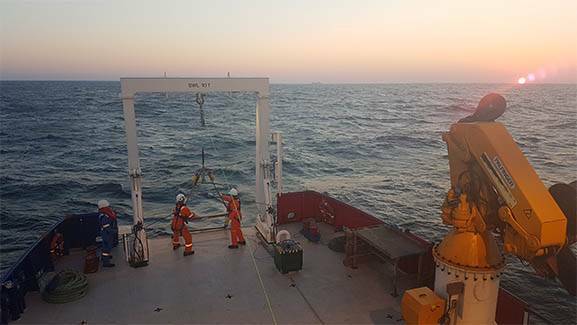 The project team set out to identify obstructions and hazardous seabed features over a 40-kilometer section of route survey in the German Baltic prior to forthcoming pipelay anchoring and mooring operations for the Nord Stream 2 pipeline project. Taking on a vessel charter, the iSURVEY team had full contract responsibility for the vessel, marine, survey, processing and reporting elements of the entire scope – a first for the group. The survey was carried out from the 42-meter vessel SeaZip Fix, on charter to iSURVEY. The vessel served as platform for the survey and remotely operated vehicle (ROV) operations, with a moonpool deployment frame providing a retractable mounting location for vessel-based attitude monitoring, positioning and geophysical sensors. Combined multi-beam echo sounder (MBES) and side scan sonar (SSS) systems were utilized throughout the survey, along with a towed magnetometer/gradiometer system.